Nothing can make a plate of food look more elegant than a garnish of tomato roses. Carved vegetables and fruits are very impressive, and have evolved into an art-form unto themselves. The WOW factor far exceeds the investment in labor it takes to create them. Once the realm of professional and highly trained culinary technicians, the internet, and YouTube specifically, has made the knowledge of how to create true art from produce available to everyone. It really doesn’t take that long to learn how to create beautiful masterpieces from tomatoes, cucumbers, strawberries… All you really need is some talent, a little learning curve, and maybe a few specialty knives, which are inexpensive. In a pinch, a normal paring knife can be used to create some of the designs. In this article, we will show you how you can create impressive garnishes, what tools you need, and where to go for more information. The actual origins of vegetable and fruit carving is a hotly contested issue. Some believe that it began in Ancient China during the Song and Tang Dynasties (1270-612 AD). Others credit Thailand (which was actually Siam at the time) with its creation during the 14th century, where it was, and is called Kae- Sa- Luk. Then there are those who believe vegetable and fruit carving began in Japan in the 15th century, where it was, and still is, called Mukimono. It wasn’t until the mid-20th century that vegetable and fruit carving began to appear outside of Asia, mostly in the better European restaurants. It eventually made its way across the ocean to North and South America. 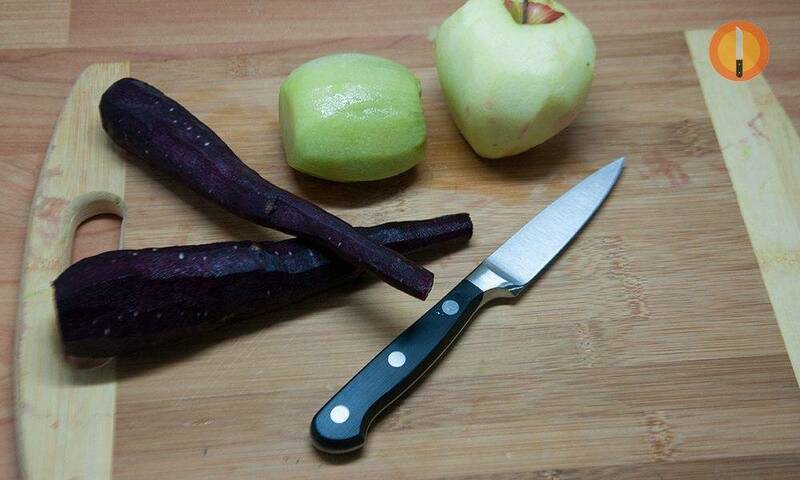 My Wusthof paring knife: a great knife to carve vegetables. As you might guess, vegetable and fruit carving/sculpting involves mostly cutting, which means it will involve the use of knives, for the most part. How many and what types will depend on how deep you want to get into it. Simple creations, such as a tomato rose can be accomplished with nothing more than a standard paring knife. 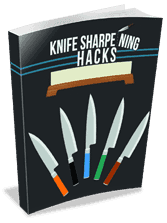 Many impressive creations can be made with normal kitchen knives, such as a Chef’s Knife, Paring Knife, Vegetable Knife, and a Peeler. Grapefruit knives can also be used on many designs. Kyocera Ceramic Knife – for making paper thin slices. Non-reactive and stays razor-sharp. Crinkle-Cut Blade – for making wavy cuts. Makes cool Wavy French Fries as well. Shape Cutters – just like cookie cutters, only smaller, and used the same way. They come in a myriad of shapes and sizes. “V” Carving Knife – used to make Vee-shaped gouges. Bird’s Beak (Tourné) Knife – smaller than a paring knife, it is used to make delicate cuts and slices. Scoopers – these come in various sizes and are used for many things, from making melon balls, to creating cavities. Banana Slicer – Used to make even and delicate slices of bananas and other soft fruits and veggies. Wedger – cuts round veggies and fruits into wedge slices. Mandolin Slicer – these are invaluable in any kitchen. Can be used with various blades to make paper thin slices of meat, vegetables and fruits, can make wave cuts, Julianne cuts, dices, and cubes, in seconds. Vegetable Spaghetti Cutter – makes thin and tiny curly strands of firmer vegetables like cucumbers and carrots, resembling spaghetti. Makes great-looking garnish and salads. Apple Corer/Curly Fry Maker – these peel apples and core them at the same time, as well as making delicious curly fries when used on a potato. There are many other tools you can use to shape and cut produce, and even meats. The only limit is your imagination. A tomato rose, as shown in this video. You don’t need much. The only tools you need are a sharp (and I mean sharp) paring knife, a cutting board, and a suitable tomato. You can add some greens to simulate leaves, such as spinach, basil, sage, lettuce, kale, etc… Your knife has to be as sharp as possible so as not to tear the peel strip, and so you can maintain precise depth and directional control. Select a firm tomato, with a deep red color. Vine-Ripe tomatoes usually work the best. You can use other colors if you want, to create different effects, such as yellow, orange, or even green tomatoes. Make sure the tomato is blemish-free, because a blemish usually indicates a fault which will cause the peel to break when you cut it. Any size tomato can work, but it is easiest with baseball, or slightly smaller tomatoes, as they are much easier to hold. Hold the tomato by the stem side, with the bottom facing up. Create a base (which keeps the rose from unraveling) by making a shallow cut, about 1” wide, around the base, and rotating the tomato around the knife blade, making a wide, thin strip. Do not detach it from the tomato. Continue cutting, and rotating the tomato, making a continuous thin strip, about 1/2” thick, and trying to get it as thin as possible without it breaking. If it breaks, throw the tomato in the soup bowl and start over with a new tomato. Continue making the strip all the way to the top of the tomato. When you start getting close to the end, you can begin tapering the strip a little. Cut the strip loose at the top, and lay it out on the cutting board, flesh side up. Here, you have a choice of starting at the base end, or the top. I have found it works better for me to start at the top, and wind the strip outwards, but you can start at the bottom, and wind inwards. Either way, start rolling the strip carefully. If you start at the base, you want to wind very loosely, with each wrap being inside the previous one, finishing in the middle. This make a tight rose. If starting at the top, just roll the strip like an egg-roll. Each wrap will be on top of the previous one, and you will finish on the outside. This makes a more ‘open’ looking rose. Tuck the rolled peel into the base to keep it from unraveling. The weight of the rose on the base will keep it from unraveling (most of the time). You can use green leafy veggies to simulate leaves. Good choices are basil, sage, kale, lettuce, spinach, etc…. That’s all there is to it. There are many more carvings you can make, and a lot of them are not much harder than the tomato rose to make. Unfortunately, available space limits me from posting the instructions here. But, thanks to the internet, YouTube, and other great sites, you can watch step-by-step videos on how to create exquisite carvings, such as apple swans, cucumber accordions, mushroom flowers, and more. And, we may be posting more directions on other carvings ourselves, so check back often. In the meantime…. Have fun, and Bon apetit.